Robert Wilson “Doc” Smith, son of Mr. and Mrs. Jesse Smith, was born in Thrall, Texas in 1918. His Longhorn teammates included Mel Deutsch, who played for the Red Sox in 1946, and infielder Grady Hatton, who spent 12 years in the majors. During the summers of 1938 to 1940, Smith also played with the Seven-Up Bottlers of Austin, one of Texas’ strongest semi-pro clubs. 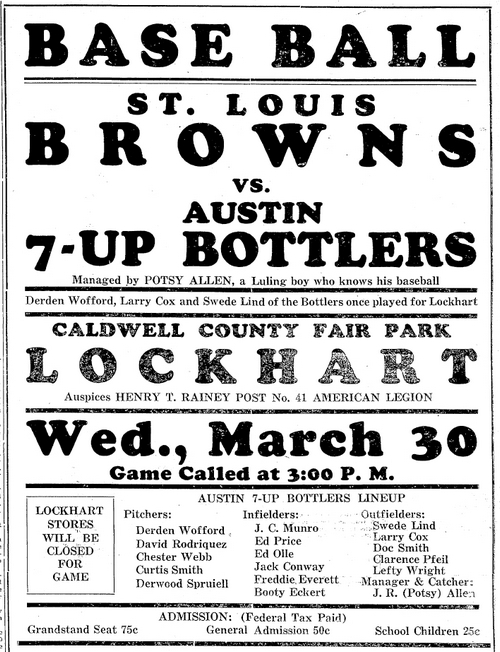 They faced the best teams in the southwest and even played against the St. Louis Browns. Smith graduated from Texas in 1941 and entered military service with the Army Air Force in November 1941. He trained as a bombardier and was commissioned a second lieutenant before being assigned to the 427th Bomb Squadron of the 303rd Bomb Group at Molesworth airfield in Cambridgeshire, England. On January 3, 1943, 2/Lt. Smith was the bombardier aboard a Boeing B-17F Flying Fortress that was part of a mission to attack torpedo storage areas at St. Nazaire, France. Piloted by 1/Lt. William H. Goetz, the bomber was attacked by a German fighter plane as it approached the French coastline, causing it to explode in flight and crash into the Atlantic Ocean off the coast of St. Nazaire. Smith, Goetz and the eight other crew members were all reported missing in action at the time. One year later their bodies had still not been recovered and all the crew were listed as killed in action. A recipient of the Air Medal and Purple Heart, Doc Wilson is memorialized at the Brittany American Cemetery in St. James, France. 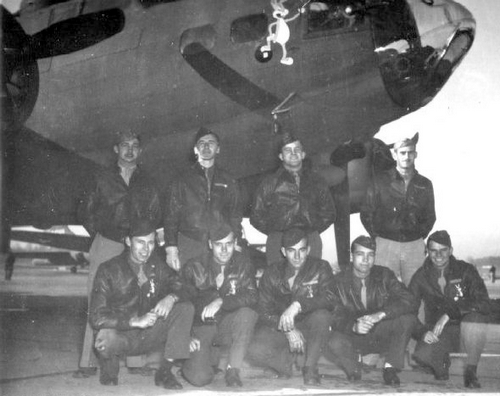 The ill-fated crew of 1/Lt. William H. Goetz. 2/Lt. R. Wilson "Doc" Smith is back row, far right.